After waiting a good amount of time in line to get ours hands on the new DROID ULTRA and DROID MAXX, here is our hands-on video and overview of the phones. The MAXX is the largest of the three newly announced DROID devices, coming in at 8.5mm thick. 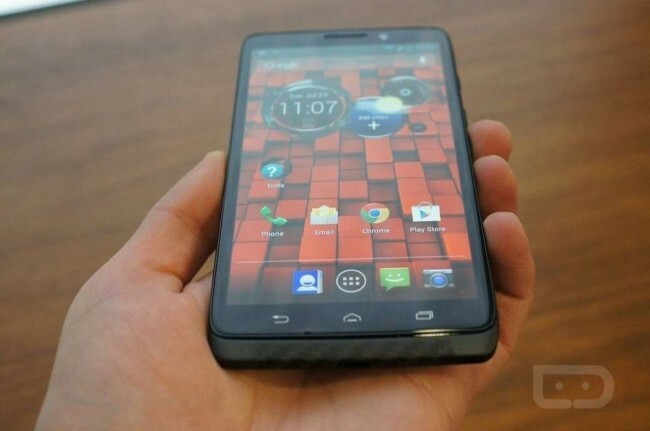 It has a 5″ OLED 720p display (non PenTile), a Snapdragon S4 Pro dual-core processor clocked at 1.7GHz and 2GB of RAM. For the most part, the MAXX is running a stock version of Android 4.2.2, but throughout the device’s software you will see certain Moto touches that help bring some of this device’s features to fruition. The phone’s main selling feature is its massive 3,500mAh battery, capable of 48 hours of talk time according to Motorola. On the back side, you will find a 10MP camera and a 2MP camera on the front. As for the ULTRA, think of it as the same exact device as the MAXX, but without the 3,500mAh battery. Instead, the ULTRA features a smaller 2,130mAh battery, capable of up to 28 hours of talk time. Besides the battery, it has the same display, same processor, same amount of RAM, same camera, same software and same everything else. Have a look below and check out our full walkthrough videos. Click here for additional DROID ULTRA and MAXX coverage.